Shopify’s Keir Whitaker reveals what it takes to become a profitable ecommerce specialist. If you’re new to the web industry you may have heard the “veterans” amongst us lament the days when we could charge companies handsomely for what amounted to a bunch of nicely designed fixed-width HTML templates. Today’s market is very different, highly competitive, and increasingly specialised. Working out how to market and profit from your skills is a constant challenge — whether you have recently taken the leap to freelance or are an established business. Today, much of the work that people like me relied upon in the mid 2000’s has moved in-house as large businesses realise “digital” is not a passing fad but something to take very seriously. Meanwhile, at the other end of the market, many are taking the first steps into “digital” via Facebook and hosted CMS platforms. Consequently, agencies and freelancers are fighting over a diminishing middle market. To succeed you have stand out and be different — one way to achieve this is to become an expert in a particular niche. In other words to specialise. I’ve worked at Shopify for the last four-and-a-half years and have witnessed the growth of both the platform (from 18,000 stores when I joined to over 325,000+ today) and the demand for talented ecommerce specialists. As a result of this growth, web designers and front-end developers with a solid understanding of the ecommerce landscape are finding themselves in exceptionally high demand. In fact, we are now seeing agencies move from offering a range of services to focus on ecommerce projects with Shopify. By specializing in ecommerce, web professionals are finding new (and profitable) ways to grow their businesses beyond traditional design and build services. In fact many of our most successful partners are succeeding by offering services that help merchants after their store has launched. In this article I’ll cover 11 that many of ecommerce specialists are offering with a view to building long lasting relationships with their clients. In the five-part podcast series The Ecommerce Customer Lifecycle, my co-host Ross explains how his business Growth Spark helps their clients with the entire ecommerce process — from initial concepts right through to encouraging repeat business. Customer service is a huge part of this lifecycle and majorly important for any business. Unfortunately, many businesses aren’t set up to deal with customer enquiries in an efficient manner. Advising a client on how to implement an effective customer service platform is a great upsell for any ecommerce project. There are a number of 'helpdesk' solutions on the market, but the one I return to — especially for those starting out with ecommerce — is HelpScout. HelpScout is an easy to configure and elegantly simple-to-use help desk application, which is free for up to three users. I often hear successful designers working in ecommerce say that the handover of the store is really just the beginning. This is the point where you can start to offer A/B (also known as split) testing. Whilst you will of course present your client with a well thought-out design, there’s always an opportunity to offer your services to make it even better. A/B testing allows you to test hypotheses in your design. For example does the “Add to Cart” button work better below or above the price? By using online tools such as Optimizely and Visual Website Optimizer, you are able to run tests to determine which button is used more and then make the recommendation to permanently move it. There are many factors that you can offer to test, including colours, layouts, type, and tone of voice. By working with your client and getting a better understanding of their store’s visitors, you can tweak and perfect the design to help them increase their sales. Another common feature found on ecommerce sites today is 'live chat.' Services such as Olark have made it ridiculously simple to implement this facility on any ecommerce site. As well as offering the option to brand the chat box in the store’s colour scheme, there are a number of other appealing features. Of particular interest to ecommerce clients is the 'cartsaver'. This feature lets you see what's in a customer's cart in real time, enabling your client to reach out to upsell or answer questions before the customer leaves the cart page. You'll often read that 'list building' (another term for collecting email addresses) is one of the best marketing tools for ecommerce sites. Having a list of opted-in subscribers who have given permission to be contacted is a great way of letting your customers know about new products and services. Therefore, having a simple way to capture email addresses is another service you'll want to offer. Thankfully, SumoMe offers us a number of ways to integrate these forms into any site. SumoMe is a suite of free (with premium upgrades) tools that help grow traffic and build email lists. These range from apps to help you analyse the popularity of your content and easy ways to share images (great for ecommerce sites), right through to numerous ways to entice visitors to sign up for a mailing list. I recommend ListBuilder and ScrollBox as starting points. Of course, once you have implemented the sign up forms using a tool like SumoMe, you can offer to design their responsive email templates for use in services such as MailChimp and Campaign Monitor. Whilst many email delivery services offer great out of the box templates, there’s nothing like the personal touch. By bringing the store’s brand to all electronic communications, you will not only showcase their values but also, I believe, show a level of care and thought that makes that company stand out. Email design is a real art and if you need inspiration I recommend browsing the MailChimp inspiration blog. It’s a great showcase of how companies and brands are using email as a communication tool. Designing email templates isn’t without it’s technical issues, but thankfully there are plenty of resources to help you get started. Following on from the more personal email newsletters we have transactional emails. Every sale generates a number of these auto-generated transactional emails – the “order confirmation” being the most common one. Transactional emails don't have to be boring. In fact, every email a store sends is a great way of interacting with a customer and serves as another extension of the stores brand. Sadly, the design of 'transactional emails' are often overlooked in favour of the system's default templates. The good news is that Shopify allows you to customise all auto-generated outbound emails – both in plain text and HTML. From copywriting to the design and layout of the HTML versions, being able to advise your clients on how best to use notification email is a great opportunity to work longer, and more profitably, with your client. You can spend time crafting your own responsive email templates (or re-use the templates you designed for their newsletter campaigns), or you could choose to use a service like Conversio, which aims to make 'supercharging' your receipts a quick and painless endeavour. Should you wish to hand-craft your templates, I strongly recommend Lee Munroe's suite of open-source email templates as a great starting point. How many times have you visited an ecommerce store and clicked on a photo expecting to get a super hi-res image of the product only to find the thumbnail appear in a lightbox? I am sure I am not alone in finding this annoying. Great product photography is key to giving buyers as much information about the product as possible. Great product photography is a differentiator. Having photos of the product from multiple angles, in different colours (if applicable), in situ (think of a watch on a wrist or a jacket being worn), and compared to other objects for size will help the buyer make a more informed decision - a more informed customer means they are less likely to return the product. Thankfully Shopify now offers the ability to associate an image with each product variant and an overall collection image too. The rise of the “Pop-up Shop” has enabled retailers to sell in person as well as online thanks to things like Shopify PoS (Point of Sale), it’s now easier than ever to take your clients store out of the cloud and onto the street. Temporary shops represent a great opportunity for web professionals. By understanding how to implement PoS, you’ll be able to offer your advice on how they can best implement their store strategy. It’s another great opportunity to take the technology barrier away for your clients. As well as offering PoS, Shopify also provides card readers that link directly to the PoS application. These are available for stores in the US, Canada, UK, and Ireland. The good news is that most of this date can be collected automatically, making piecing the report together not too labour intensive. If you unsure where to start here are five reports that will set you on your way. There’s no escaping the importance of social media when it comes to ecommerce. It’s hard to ignore when you frequently read how stores have “blown up” thanks to a tweet from a key influencer. Twitter, Facebook, Instagram, and Pinterest are four popular channels that you can help your clients with. For example both Twitter and Facebook offer the ability to create custom headers and avatars. Again, this represents another opportunity to extend the brand consistently across platforms. I firmly believe that multiple “channels” are the future of ecommerce. Being able to help your ecommerce clients get to grips with different social media platforms is a great opportunity to help them stand out from the crowd. It’s also really easy to integrate products and collections into your client's existing online portfolio using the easy to create and customise Shopify Buy Button. These often go overlooked but by taking the time to extend the brand to printed material will also show attention to detail and extend the stores brand beyond the screen. As the web industry becomes increasingly competitive specialisation not only makes it easier to market yourself, but also allows you to deep dive into an area and become an expert. By extending your ecommerce knowledge and services into new areas it will allow you to work with clients well beyond the launch of their online store. 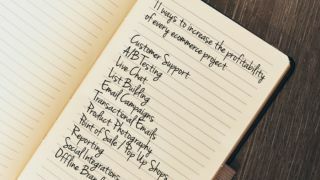 Let me know in the comments how you are helping your ecommerce clients prosper. If you’ve found these ideas of interest you might also find our latest 11 chapter book Grow Vol. 2: Becoming a Full-Stack Web Design Freelancer worthy of a read. You can read the articles online or download your own PDF copy.